A couple of days ago I was craving greens for lunch but we were out of salad ingredients and I didn't much fancy getting out of my dressing gown and going to the shop, so I turned to the freezer for help. Recently we've started buying some frozen veg rather than fresh because it saves a lot of money and lasts a lot longer. 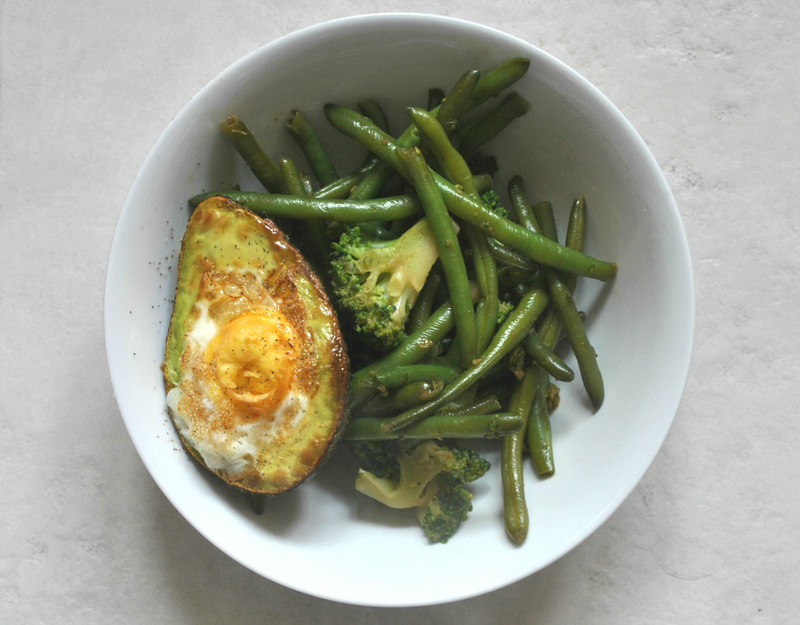 The green beans and broccoli caught my eye, as did the avocado in the fridge, and this little combination was born; soy and garlic sautéed broccoli and green beans with baked egg and avocado. Oh yes. 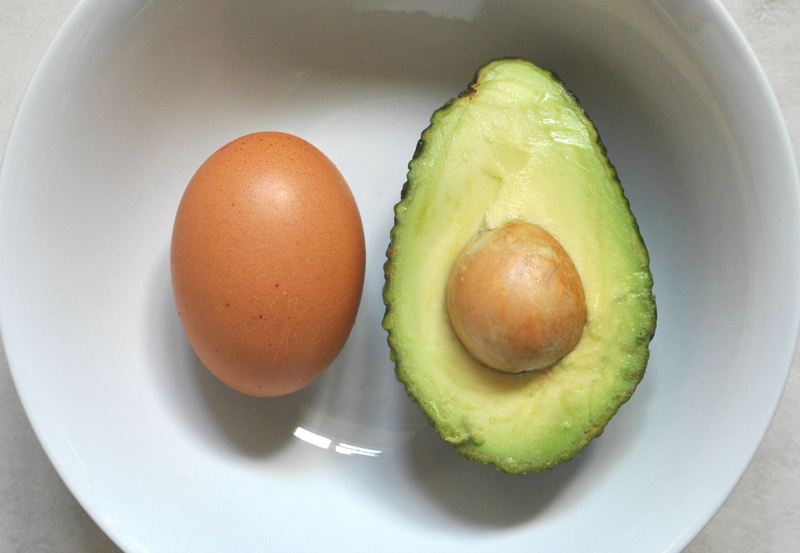 To me this is the perfect lunch or brunch, and if you're feeling extra hungry you could always use both halves of the avocado and two eggs, or add in a slice of wholemeal toast. This only takes around 15-20 minutes to prepare, and is super easy, especially if you're using frozen vegetables as I did. I looked at a few recipes for eggs baked in avocado and most seemed to suggest baking for 15 minutes at 425°F/220°C/Gas Mark 7, although for my oven I think this was a little too hot as the outside of the egg cooked very quickly and got almost a little too crunchy, so in future I'll probably cook it at a slightly lower temperature. The veg took no more than ten minutes to prepare, so I cooked those whilst the egg was baking, and that was it! Step one - Switch your oven on and get some water on the boil. Step two - Prepare your egg and avocado. This step is a little fiddly, but if you take your time it's not so bad. Cut your avocado in half and, if you're only using one half, wrap the half with the stone still in it in tin foil and pop in the fridge, and use within two days. If you're using both halves, remove and discard the stone. Using a spoon, scoop some of the flesh out from where the stone was to make room for the egg. It's up to you what you do with the excess flesh; I ate mine straight off the spoon, but you could always set it to one side and put it on top once everything is cooked. 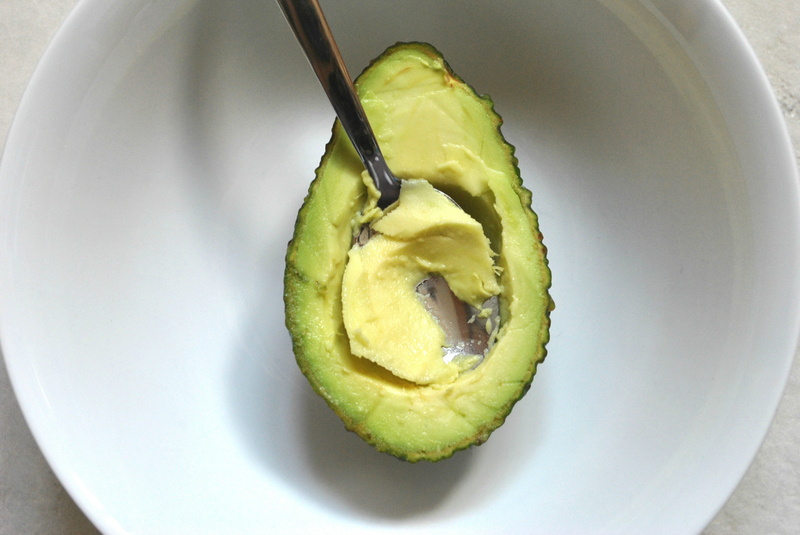 Since avocados tend to roll around a bit, you might want to steady yours in a ramekin or on a ring of tin foil on a baking tray before cracking your egg and pouring it into the hole you made. The recipes I looked at recommended trying to get the yolk in first, then allowing the white to fill the rest of the space. If you have any left over white, either put it in the fridge and use for omelettes or baking, or dispose of it (but not down the sink). 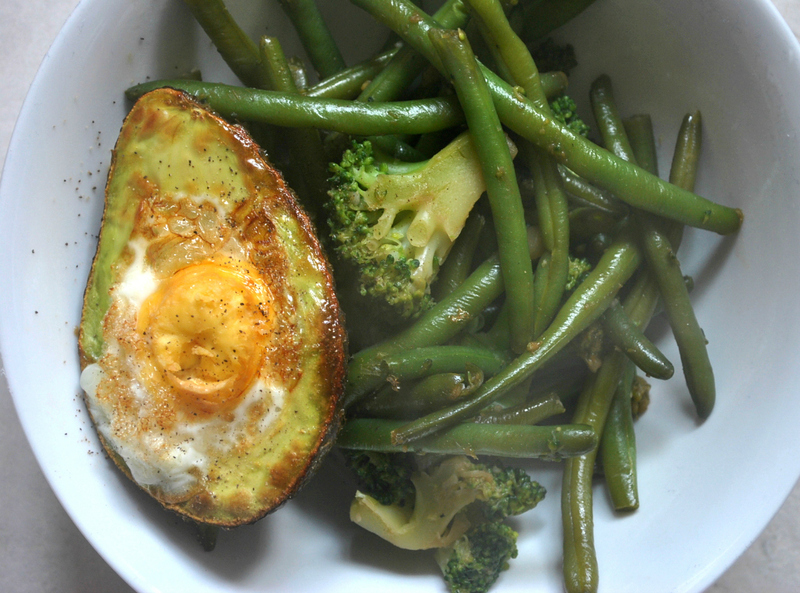 Step three - Pop your eggy avocado in the oven and bake for around 15 minutes. Keep an eye on it, though, as ovens do vary and you may find it takes more or less time in yours. Step four - Start preparing your vegetables. If you're using fresh, chop the ends off your beans and cut the broccoli into bite-size florets, then, no matter whether your vegetables are fresh or frozen, gently boil for about five minutes. Once boiled, drain the water and transfer them back to the pan you boiled them in, which should be empty. Put the heat on low, and add some garlic (you can use freshly crushed or purée) and soy sauce. Sauté for a few minutes until the vegetables start to brown slightly. Step five - By now your avocado should be almost done, so turn the heat off on your veg and cover to keep them warm, and remove your avocado from the oven. Check that the egg is fully cooked, and if so, put the greens into a bowl, place the avocado on top and season with a little pepper. And that's it! It's so simple and easy, and doesn't require any unusual ingredients. You've got the goodness of the greens, plus the protein and healthy fats from the egg and avocado. Wholesome, simple food at it's finest.